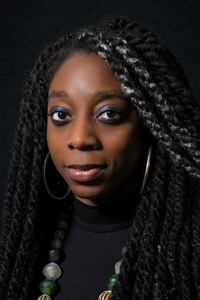 Akosua Adoma Owusu (born January 1, 1984) is a Ghanaian-American avant-garde filmmaker and producer whose films have screened worldwide in prestigious film festivals, museums, galleries, universities and microcinemas since 2005. Her work addresses the collision of identities, where the African immigrant located in the United States has a “triple consciousness.” Owusu interprets Du Bois’ notion of double consciousness and creates a third identity or consciousness, representing the diverse consciousness of women and African immigrants interacting in African, white American, and black American culture. More info at First Person Cinema.